At long last. Production stills released from Avatar 2. Yeah, it's really shaping up. Yeah, it's really shaping up. Here's another, I can't believe Will Smith is going to be in it. 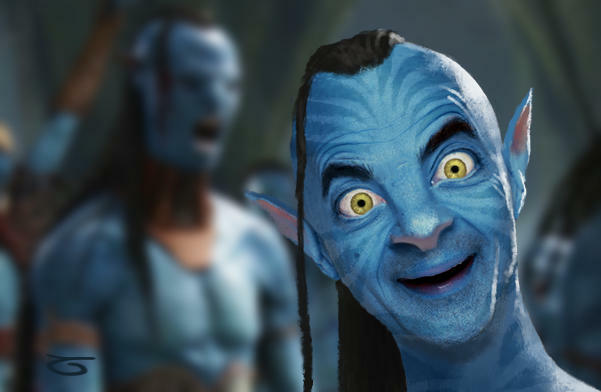 I liked the first Avatar movie and I'll likely go see any sequels/prequels that end up happening. But to be honest beyond the wonderful CGI the whole "premise" of the movie was just a tad too preachy and stilted for my liking. Basically to me it was effectively "Dances with Blue Aliens" and frankly the original "Dances with Wolves" was simply a much better version of that same story. Even "Dances with Samurai" (which is what I call the Tom Cruise "The Last Samurai" movie) was arguably better. My problem with Avatar was the massive genetic modification those trees were doing to whole species, and in the case of the tall blue bipeds, on another sapient species to create what amounts to a slave race. Unless there's a slave revolt, I have no interest in the sequel. Never really considered a "master/slave" angle with the movie but I guess you could get there if you squint real hard at the relationship you're talking about. To me the whole "new agey/mother nature/soul of the planet" thing was laid on a bit thick and preachy regardless. I can only imagine that aspect of the original movie will be repeated in the next one. The real problem I have with a sequel is how the human-based corporation/military is going to realistically respond to the events of the last movie. Either they are going to leave Pandora completely alone (not likely) or they are going to return with an armada big enough to vaporize the entire ball of wax or at least enough troops to exterminate every last Na'vi standing. Considering that the metal they were mining on Pandora (ironically named Unobtanium) had supposedly become the key to humanity's survival I doubt they are just going to give up so easily. A Civil War era Union soldier (John Dunbar played by Kevin Costner) who is shot in the leg and basically expects to die miraculously survives his injury. Based on this life-altering event he decides to head out to the frontier to restart his life away from the chaos of civilization. A fresh start. Once Dunbar volunteers to serve at a remote western outpost where he's all alone he soon begins to encounter the local tribe of Native Americans. At first Dunbar and the locals distrust and misunderstand each other. Both sides obviously have many false prejudices against the other. But slowly over time he manages to gain the trust of the locals to the point where he goes to meet them at their camp. While visiting the locals he finds a woman who is clearly part of the local tribe but happens to be white. Dramatically he finds and saves her just as she's killing herself in an act of morning for the lost of her native husband. Turns out this woman had been saved years ago by the tribe when she was an orphaned child and has grown up as an adopted daughter to one of the tribal leaders Dunbar has become friendly with. So he spends time with the woman who helps to teach him about their language and culture. Turns out she's actually a pretty strong woman (much like Avatar's Neytiri) whose tribal name is "Stands with a Fist" because she didn't let the other native children tease her about being white as a child. She remembers enough English from her childhood to help translate for him. Eventually they develop a real relationship and he becomes accepted as a member of the tribe. They name Dunbar "Dances with Wolves" because they watch him interact with a wolf that he befriends. They allow Stands and Dunbar to become engaged. By this time Dunbar has long given up his outpost or any pretense of being a "soldier". But when everything seems to be going great the Union army comes back to the abandoned outpost to track down what happened to Dunbar. Of course being "unenlightened" the soldiers don't take kindly to the tribe or to Dunbar once they find him and see that he's "gone native". There's some fighting and several of the tribe get killed. Dunbar manages to persuade the rest of the tribe to flee north into Canada where they presumably live the rest of their lives in peace. Obviously it's not 100% identical to Avatar but unmistakably you've got all the same major plot points that matter. Perhaps if I had seen Avatar first I'd say Dances with Wolves "ripped off" Avatar, but clearly Dances with Wolves (and even The Last Samurai which again had the same basic "white man goes native" plotline) came first and is still arguably the better movie story-wise. Even though I've effectively spoiled the entire movie for you I'd still recommend you seeing it. It's good enough that I've watched it several times and I'll probably see it again sometime. Avatar is basically the Smurfs, the origin of Smurfette to be precise. I don't recall him expecting to die. Rather, his leg got messed up bad. They were going to take his leg. He then risked his life to draw enemy fire, so they'd waste their ammo, his side could get in and win, and then the general rewarded him with a better doctor who could save the leg. It would have been pretty well known by Civil War soldiers that living through getting a limb amputated was probably no better than a 50/50 chance (at best). So rather than risk that kind of agonizing death it was pretty clear that Dunbar decided to put his boot back on, mount a horse and basically die a slightly more honorable death riding back into battle. It's obvious he rode back in such a way as to draw the enemy's fire, but at that point he wasn't seriously concerned whether he'd live or not. He even let go of the horse's reins, raised his arms out and tilted his head back in a classic, "I'm coming to meet you Jesus!" pose fully expecting to get totally ripped apart by gunfire. Then by some miracleTM when he didn't actually get shot his fellow Union soldiers (who up to that point had just been dumbfoundedly watching Dunbar and his suicidal maneuver) took advantage of the situation and charged the Confederates who had just been stupid enough to all try to shoot at Dunbar at the same time. When the Union was winning the battle only then did the commanding Union general come to where Dunbar had fallen from his horse exhausted and called for his personal doctor to treat Dunbar without having the amputation. Dunbar realized the fact that he had been spared was basically "amazing" so he decided in that life altering moment to "Go West" and do something meaningful with his life. It's important to note that the story instantly starts with Dunbar's decision to remount a horse and that we know absolutely nothing about what happened in his life up to that point. That was the writer's way to tell us that Dunbar was essentially "Born Again" that day and that whatever person he was before that point had been killed off (at least metaphorically speaking). Basically the story only makes sense if Dunbar was expecting to die heroically on the battlefield that day but by some twist of fate didn't. I always had the feeling it was more "I'd rather die than lose my leg." Edit: Someone was nice enough to put a few minutes focusing on what we're talking about here up on YouTube. Enjoy.